What is the best diet for my cat? Cats can be fastidious creatures when it comes to what they eat and perhaps with good reason! Unlike dogs that are far less pernickety about what passes their lips, cats have specific physiological demands with regard to diet. Despite the fact they are often compared to one another, cats and dogs are fairly dissimilar in their nutritional needs. Dogs are sometimes described as carnivores, but it is probably more accurate to refer to them as omnivores that can eat a combination of meat and plant-based protein. Cats, on the other hand, are obligate carnivores that have a hard time processing and utilising plant proteins. They absolutely need meat to survive and can fare very badly on a diet of grain and vegetables. But why is this? Put simply, cats lack the metabolic pathways needed to effectively process plant proteins. As obligate carnivores, nutrients such as taurine, arginine, arachidonic acid, niacin and vitamins A and B12, are needed for internal health and functioning. Ultimately, cats that are deficient in these essential nutrients may suffer a range of serious conditions, from retinal degeneration and loss of vision to severe cardiac damage. Unlike meat proteins, which contain a complete amino acid profile, the composition of plant proteins is incomplete, leaving cats with a nutrient deficit. Because dogs and humans possess the pathways needed to utilise plant proteins, they are able to deal with this incomplete nutrient profile without any ill effects. This is not the case for cats, which are designed to derive protein from meat and organs. Cats are also different from dogs in that they are notoriously bad drinkers. They may visit the water bowl for a sip here and there but they are nothing like dogs when it comes to keeping themselves hydrated. For this reason, dogs might be able to thrive on a diet of dry kibble containing 8-10% moisture, but cats are maintained much better on a wet diet consisting of 75-78% moisture. Owners that choose to feed a dry kibble to their cat(s) can benefit enormously from mixing a little water into the food beforehand. So, what is the best diet for my cat? We now know that a wet, meat-rich diet is best for cats, in order for them to live long, healthy lives. We also know the importance of keeping your cat hydrated by allowing constant access to fresh drinking water. Contrary to popular belief, cow's milk is not a substitute as most cats are lactose intolerant once weaned. As with dogs and horses, it is recommended that rather than feeding one large meal a day, the daily ration is split into several smaller meals, fed at regular intervals. This ensures the digestive process is kept ticking over and minimises the amount of stomach acid left festering in the gut. It is also worth considering the cat's natural diet. In the wild, cats would eat uncooked, whole rodents, small birds and fish. This included the skin, bones and organs of the carcass. The carbohydrate content of a mouse is very little, so cats were kept lean and healthy. Up until the late 1970's when dried 'kibble' was first introduced, commercial cat food consisted almost exclusively of tinned fish. This was usually supplemented with vitamins and minerals in a wet food form. Because the food was wet (80% moisture), rates of digestive and urinary disease were much lower than they are today. Unsurprisingly, the low carbohydrate content of the traditional diets also meant that obesity was much less prevalent before. It was with the advent of cheap and palatable dry foods that these problems first began rearing their ugly heads. Meat was expensive, so, to keeps costs down, dry diets needed to be "bulked up." This meant including cheap fillers such as cereals and grains. Because cats have a tough time processing these ingredients, many quickly became alleric. Likewise, because of the unnaturally high carbohydrate content of the dry diet, many cats also became overweight. This remains the case today. While protein is essential for cats, carbohydrate is not, and cats actually require very little of it. The dry kibble contains much, much more carbohydrate than the wet, tinned food equivalent. That is not to say that dry foods should be avoided altogether. The majority of all dried diets have been carefully formulated to be well-balanced, especially the higher end foods that are rich in meat protein. Acana and Orijen are such foods that contain a high percentage of meat for the internal support and nourishment of cats. The diets are palatable, complete and abound with valuable nutrients for promoting dietary health. Generally speaking, the best advice would be - to ensure cats are kept lean and healthy, take care when choosing a dried, commercial kibble and, if possible, consider a higher quality wet food instead. To view our complete range of diets, click here. Also, make sure the diet you are feeding your cat is suitable for its age, health and lifestyle. After all, kittens require a very different nutrient profile than adult and senior cats. Likewise, cats that are convalescing following surgery, illness or injury, will need a different balance of nutrients than a healthy cat. The amount of food needed also depends on its activity level and body weight. Outdoor cats tend to eat more than the average house cat because they are typically more active. House cats are very prone to weight gain because they spend a large portion of their day sleeping. In this incidence, a carbohydrate-rich diet can be very damaging. When it comes to the feline diet, the two most important things to remember are protein and moisture. Even if your cat seems to be enjoying the cheap commercial kibble you are feeding it, chances are the money you're saving now will be made up in vet bills in the future. At some point or another, your cat is going to come unstuck on this type of unnatural diet. Raw and home-cooked diets are recommended by many, although, in light of cost, they are not a practical option for everyone. If you don't wish to switch onto a wet diet, try adding a little water to the dry kibble before feeding it to your cat. This will help its passage through the system and reduce the likelihood of urinary and kidney problems further down the line. 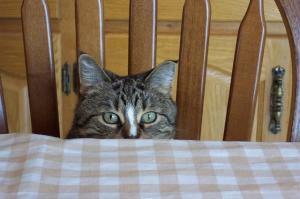 Avoid human foods (many of which are posionous to cats! ), and keep commercial treats to a minimum.